1828 – French explorer René Caillié (pictured) became the first non-Muslim to enter Timbuktu who returned alive, for which he later received a 10,000-franc prize from the Société de géographie. 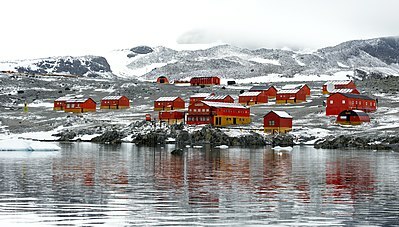 Esperanza Base, established in 1953, is located in Hope Bay on the Trinity Peninsula of the larger Antarctic Peninsula. One of 76 Antarctic research stations maintained by 30 countries, it is one of 44 permanent bases (i.e., open all year versus summer only), and one of Argentina’s 13 research bases. Esperanza Base contains 43 buildings with just over 3,744 square metres (40,300 sq ft) of space. In 1978, the birth of Emilio Palma was orchestrated to occur at the base, the first person born on the continent of Antarctica. This Wikipedia is written in English. Started in 2001 (2001), it currently contains 5,844,945 articles. Many other Wikipedias are available; some of the largest are listed below.